This is a review of the Downlite Extra Soft pillow. What is special about this pillow is that while it is considered to be very soft, it is actually also very flat. Before coming to the conclusion that this is an uncomfortable and useless pillow, it is important to understand that it is flat by design. Before getting into the actual specifications and customer opinions on this pillow, we first want to point out that it is especially made for stomach sleepers. These are people are basically sleep on their stomachs instead of their backs or sides. If this does not apply to you, there may be some other uses for this pillow. We will go over this at a later point. The reason why stomach sleepers need a pillow like the Downlite are varied. For example, they need a flat pillow so that there heads do not get pushed backwards and cause neck issues. Another factor to this is that this pillow is made of down. For stomach sleepers, having good airflow within a pillow is very important. When sleeping on one’s stomach, breathing issues can become a factor. With a hypoallergenic down pillow, breathing can be easier for those who have sensitivities. This pillow is made of duck down. This down is thoroughly cleaned in order to make the pillow completely hypoallergenic. This flat pillow is especially made for those who feel like regular pillows are just too full. One of the benefits of duck down in general is that it provides plenty of airflow as opposed to synthetic materials. This means that you will not get overheated while sleeping. Duck down also has the ability to be compressed into a far smaller size than synthetic materials. But it can easily be fluffed up again if needed for a different kind of comfort. Some people like to scrunch up this pillow in order to mold it over their heads and ears. One customer noted that she is able to cover her ears and eyes with this pillow so that she can get a sounder sleep. In this pillow is large enough that it does so very effectively. We also want to point out that unlike most down products, this down pillow is completely machine washable and dryable. You’ll be hard-pressed to find another down pillow that offers the same easy maintenance. Extra soft: While it does provide plenty of support, and even though it is very flat, this pillow is extra soft. This means a high-end luxury comfort feel that you would normally find in a nice hotel. Fill power: This pillow is made of white duck down with a fill power of anywhere between 525 and 550. Hypoallergenic down: The majority of high quality down products these days are made to be Hypoallergenic, so this comes as no surprise. However, we at least want to give you the peace of mind in knowing that purchasing a down pillow will not flare up any allergies or sensitivities. 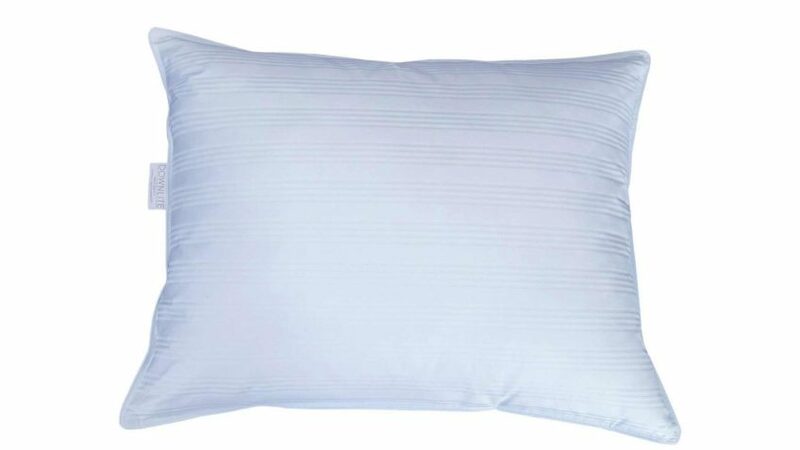 Finished in the USA: While the shell is made in China, this pillow is actually stuffed and completed in the USA. No removal case: You will actually want to purchase a couple of removable cases for this pillow if you want to keep from putting it in the washer all the time. Some people put a couple of pillowcases over top of the pillow so that they never have to actually wash it. Can be rolled and folded onto itself: many people like this pillow because it can take the shape of whatever they wanted to. In most cases, it is used to fit around the head and neck to a point where no memory foam is needed. Better than memory foam: In some ways, this pillow is far superior than memory foam. Memory foam tends to clump up over time and a dent will actually be created in the middle. Also, you cannot wash memory foam. While memory foam can make you feel like you were sleeping on a cloud, so does a down pillow. And, this down pillow is far more durable and has a longer lifespan than memory foam products! Standard – 20 x 26 with 12 oz. Queen – 20 x 30 with 14 oz. King – 20 x 36 with 16 oz. We mentioned earlier that this pillow is specifically made for stomach sleepers. But did you know that it is also used for other purposes besides sleeping on the stomach? For example, rather than purchasing a heavy and thick down pillow, side sleepers can put the Downlite Extra Soft pillow over top of all of the others and get the same luxury feel as stomach sleepers. The Downlite Extra Soft pillow is made for stomach sleepers. It has all of the qualities that are stomach sleeper would want; breathability, neck comfort, no allergens, and efficient reshaping and fluffing. Some side sleepers will purchase this pillow to put over top of synthetic pillows. This makes it a much cheaper alternative to purchasing heavy down pillows. This pillow has been highly popular for the past few years and has kept on making comebacks based on popular demand. We cannot recommend this pillow enough for those who need the particular features mentioned above. If you have any questions or concerns, or comments to be made about this review, please leave it in the comment box below.